Note: So this is set in my Santa Clarita arc.. which is way bigger than I ever imagined it and not even close to being done. I imagined my own technology in this one. Connected to the zero system, Heero could see.. everything. It was his first battle since he’d joined with Maxwell, after the other had been so injured. The coupling replayed in his mind, slowly, feeling like it took the same hours in that stolen bed, with half dying lover. That had been months before and in the actual seconds of time that Heero was in battle, his mind was in that moment, that bed, with a feverish and half delirious Duo Maxwell. He knew, without emotion, but he knew very clearly that those hours with Duo Maxwell had irrevocably altered his mind. Jacked into the zero system, fighting two hundred targets, and as the outcomes narrowed, it became increasingly likely that he was going to lose. Explosions rocked his trajectory and sent ripples of distress through Wing’s system. As death seemed to be the most likely outcome, Zero traced his death back to the moment when fire woke in him and he desired that battered soldier. Maybe it was that Duo wanted him - him - not what he could do, but just him. And he thought, as he and Zero spun around, ending the questionable existence of more mobile dolls, that it was okay because while his story was going to end at least he’d finally had a moment to begin. Heero’s eye twitched. The return of facial expression his mind fell out of sync with Zero felt strange, like falling out of sleep, hitting the ground hard, breath knocked out of you. Heero blinked, couldn’t find the likely outcome of the battle in his mind because he was too far out of sync with Zero. A senseless joy came over him that Duo was there with him. Everything was going to be okay! Heero blinked. It didn’t make any sense. Could Duo have targeted the same convoy? Maybe Maxwell was following him? The assigned mission was to destroy the convoy, which Zero told him he could do, but it would use all his last reserves and he would not be able to retreat at the end. With Duo cursing him out, he wondered why that had ever seemed like a reasonable idea. Independent of Zero’s complete mission oriented nature, his own broken mind seemed incapable of completing his assigned mission. He checked his status and found that he was indeed running low on oxygen and that here was a small object just barely large enough to be a hanger for a gundam at the location that Duo had given him. Heero blinked again, wrinkled his nose, trying to decide if he did indeed accept missions from Duo Maxwell, or if he should stay where he was like King Leonidas and fight to the last breath. “Confirm new mission assignment,” Duo growled indisputable authority. “Good! Go!” Duo screamed cutting the connection. Zero accepted the re-calibration, but refused to sync with him, due to oxygen deprivation. All the remaining reserves were thrown into the retreat, into the need to regain supplies, spinning Heero like a child as the artificial gravity cut out. Time stretched out for him as he watched Duo fighting without a Zero system, but his energy scythe cut through metal, filling the void with debris. Heero tried to hijack the Zero system back to calculate Duo’s odds of survival until he could return as reinforcement, but Zero locked him out. The mobile hanger must have been cloaked, or Duo had transferred parts. Distantly Heero thought he remembered a knock and shift in weight right before Duo had started talking to him, but in either case, none of the dolls followed him. His mind wandered back to the last time they’d been together, Duo’s lips so hot with fever, those eyes clouded and confused, his voice begging Heero to kiss him. It hadn’t made any sense then to be kissed, to touch lips, and then tongues, like such a behavior could only be for the purpose of establishing some kind of nonverbal contract of reciprocal altruism. Mobile dolls and piloted enemy mecha swarmed Deathscythe, until the combat was like a molecule itself, with hundreds of electrons and Duo as the nucleus... obviously powered by charmed particles. The really didn’t look good. The mobile hanger that Duo sent him to closed around him. Duo’s robotic maintenance spiders spun netting around him, repairing, refilling, and in moments, the flow of life giving air was restored. Zero had been taken off line though and when the swarm of contact became a small sun, Heero hadn’t had his oxygen restored long enough to be clear minded. He could see Duo falling into the sun so clearly, arms failing, braid whipping against the air. He saw the solar flare that snapped up and consumed him. 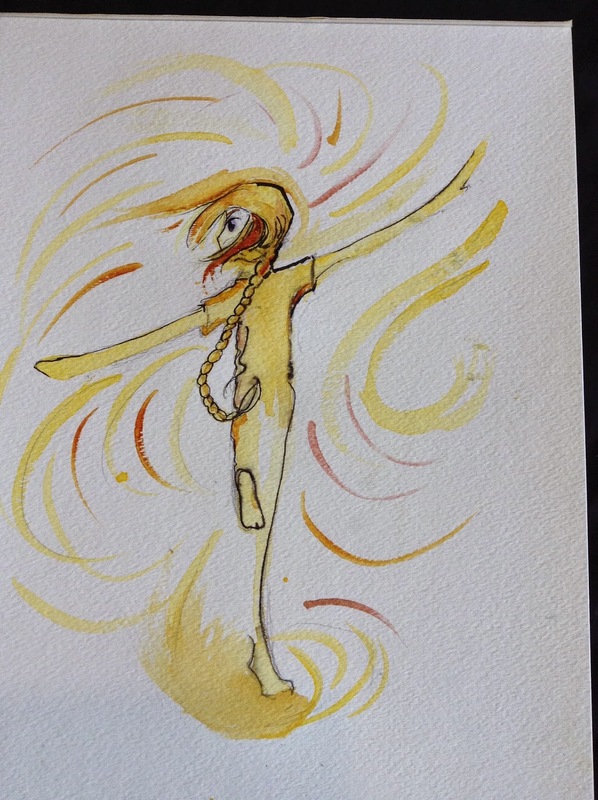 Duo stood there then, all made of sunlight, arms out, braid made of flame and twisting around as he danced, barefoot in the sun, where it was always summer. Heero reached up and touched his view screen, the great golden ball of flame that was the sun right there in front of him and he longed for it to expand and consume him too. He wanted to go to the land of endless summer! He wanted to dance and spin like Duo! To smile like Duo! He wanted to kiss him, to press sunlight lips to sunlight lips and drink in all that sustains light. As the light began to contract, the realized there was blood all over his hand, and then that the blood must have come from him, which lead his attention to his abdomen, which at some point had sustained a large piercing injury. The explosions rocked all of the convoy, piercing hulls up and down the line. Duo made the sign of the cross and drifted away. Mobile dolls without a controller were no threat to him. Once he was close enough to be covered by the stealth on his mobile hanger, he started making sure he was suited up. He tethered Deathscythe as securely as he could, because there was only room for one gundam in the hanger. Wearing just his suit, which wasn’t really rated for prolonged exposure to space, he crawled out of his cockpit and into the tiny hanger. The little space had no gravity, but it was fitted with basic life support. Heero’s hand wrapped around Duo’s braid, holding tight and that was what they needed for the moment.